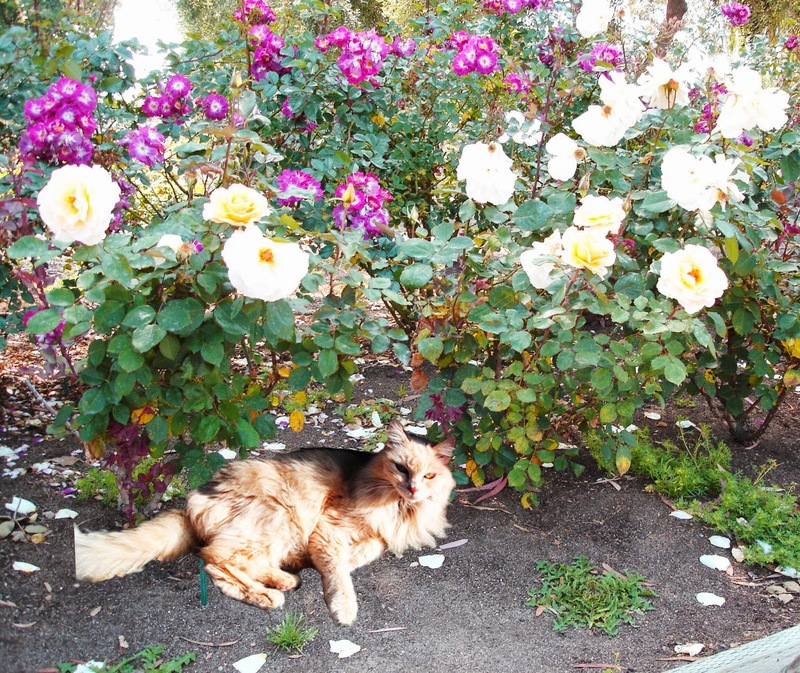 Often times, I would come home from my day at the office to find my cat napping under the rose bushes and she would wake up with one eye open, stretch and then get up greet me. I never took a photo of that but that is how I remember my dear sweet cat who is no longer here. I very much wanted to do this painting, so I played with Photoshop and made a layered photo to use as my reference similar to the sketch above. I tried to do this painting once before but it, unfortunately, turned out to be a horrible disaster combining acrylics and colored pencils. I long ago gave up on that painting and now keep it nearby me as a reference for the colors. It was a pain to sketch this out on watercolor paper but here it is. I used a vermillion watercolor pencil. I've been working on this painting for a few weeks now, just taking my time. It's far from being done but I can now see the finishing line. Here are some photo stages from the last couple of weeks to its current stage. The main art elements of this painting are shapes with patterns and vibrant color. I'm hoping the cat's face will be a strong enough focal point because this is not following the golden mean rule or any of the sweet spots of focal points. In doing this painting of my old beautiful cat, I was thinking about aging. This is my take on this subject which is nothing as grand as the still life masterpieces of the old Dutch masters. I'm hoping mine is more of a beautiful acceptance on the concept aging. We all get to that point in life where we must let go of our youth and youthful beauty. The flower petals are falling off, leaves are turning brown, and my cat is not as gorgeous as she use to be - though she is still a lovely and is a lovely soul. Letting go of youth and accepting the beauty of aging and all that goes with it is my story of this painting, but it can also be any story the viewer wishes it to be. Last weekend, I attended a seafood soiree where we wore bibs and dug into crab legs and other shell fish with our fingers with glee! I met so many interesting fun people and had a great time talking to a retired F-18 jet pilot who just retired as a base commander. Now he and his wife are traveling around in a 5-Wheeler and are currently at Coronado, bumming around. There was a big to-do at his "Changing of the Guard". There was a jet that flew before the audience at the base and when it landed it was right behind the podium with his name on painted on this jet. Then, the new commander came up and saluted him and he saluted back, and then he and his wife walked down the aisle to their '66 red mustang convertible driving and waving to the crowd at the base. Wow! We should all go out something like that! I'm thinking of a very artistic way to celebrate, since this is a big birthday year for me. I still haven't come up with anything, but wouldn't it be great for a celebration to make you as happy as my Navy commander friend. 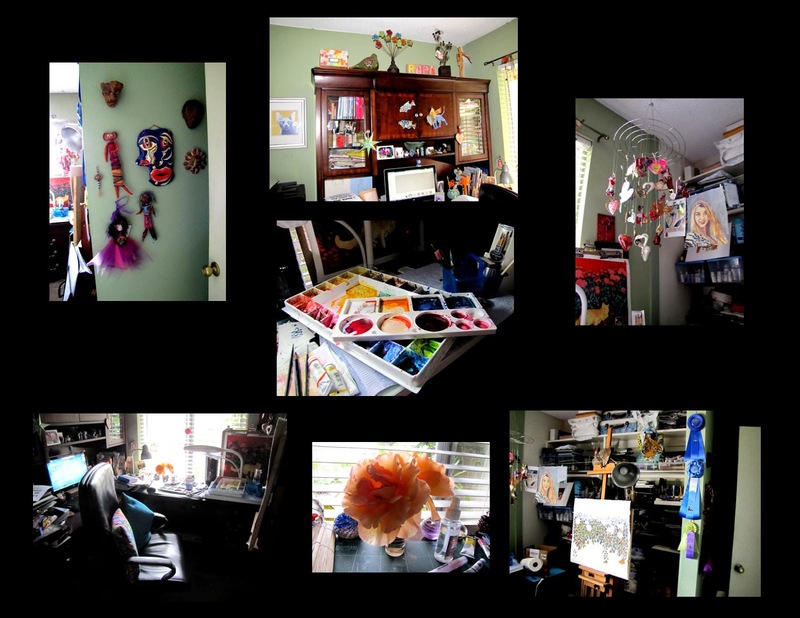 I thought I'd give a glimpse of my art studio, small that it is and how it looks as I'm painting this painting. The roses smell lovely and are also used as a reference. I finally got rid of my old office nameplate and found these block letters for $1 a piece. Good thing I have a very short art name - RAPA. I'll probably paint those letters in other colors with some patterns. My book shelf hasn't gone up yet so that part of the room isn't shown. It turns out that I can't fit my drawing table in here, so it' stays in the bedroom and my desk will just get paint all over it - it's all good. I just love that I can have most of my art supplies in this room and it's accessible. I still have another locker full of stuff, but my most important supplies are within reach. There's a stretch of wire running across the closet full of supplies. Like fresh washed laundry, I like to hang my completed art on this until I get it matted, framed or mailed. Entering the room, you immediately see the wall with art dolls and masks all made from my artist friends. The dolls are from an artist whose first name is Ruth and is known as Art_Junkie. The "Picasso" mask is made from a very dear friend Joan who gave this to me back in the 90s. I have a cherished Heart Mobile with hearts made from many different artists from all over. I have to show some of the various ribbons I've won from shows and exhibitions - happy memories! My desk, though a mess, is also covered with art from a lot of artists I trade with. Hope you like it and happy creating!